Although the early years at Cylinders, from 2007 on, were spent clearing and repairing the site and the buildings, and it could not be opened to the general public, a lot of groundwork was achieved. 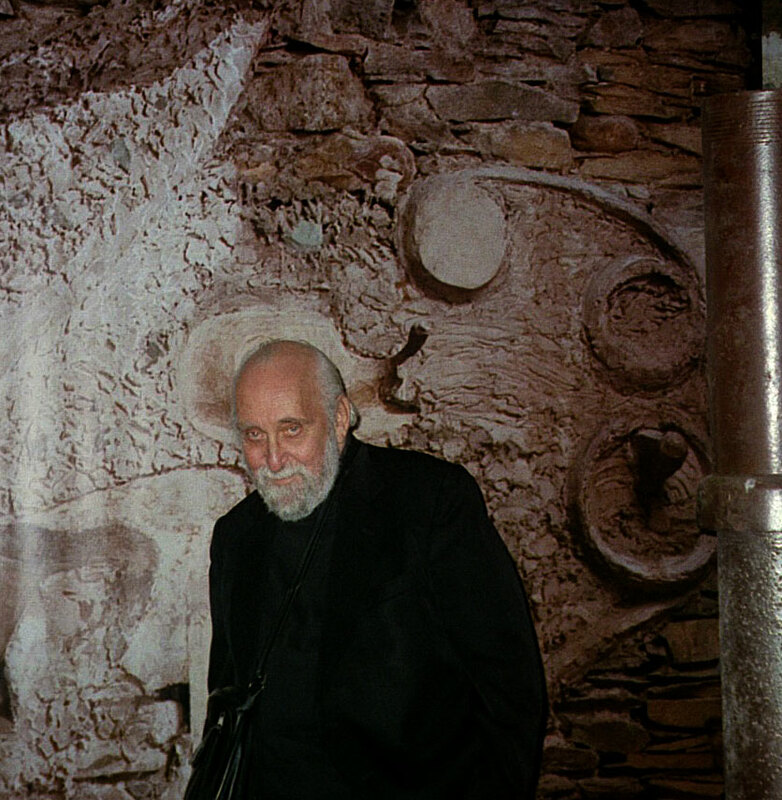 The first exhibition in the Shippon was already being planned in January 2007 (‘Schwitters and the Merz Barn’), visits were made to the Sprengel Museum Schwitters archive, and to the Schwitters-hytta on the island of Hertøya in Norway, consultations were held with architects, conservationists, and landscape architects; seminars on the future of the Merz Barn continued. Fund-raising was also a priority, and there were frequent, rather seldom productive, meetings with officers from the Arts Council and the Heritage Lottery Fund. 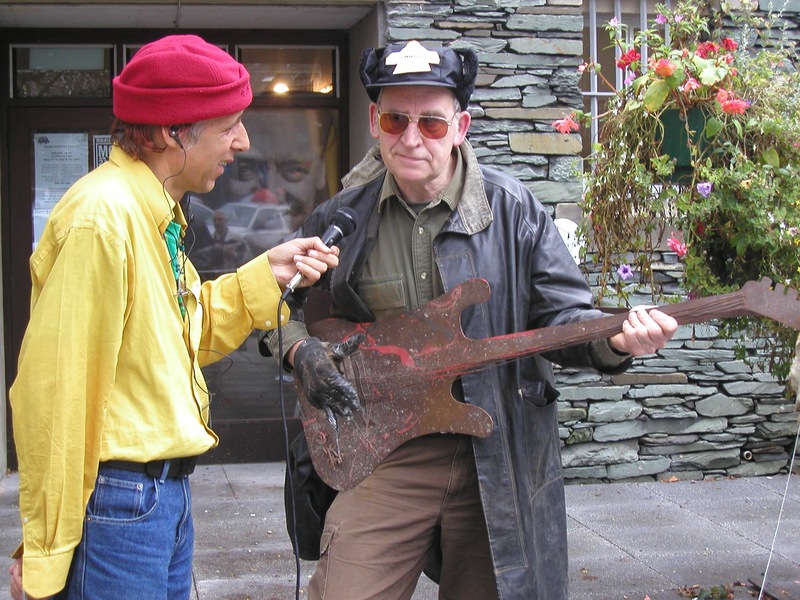 Outside the Old Police Station, Ambleside 2007: Roger Drury interviews Cumbrian performance artist Kevin O’Connor. 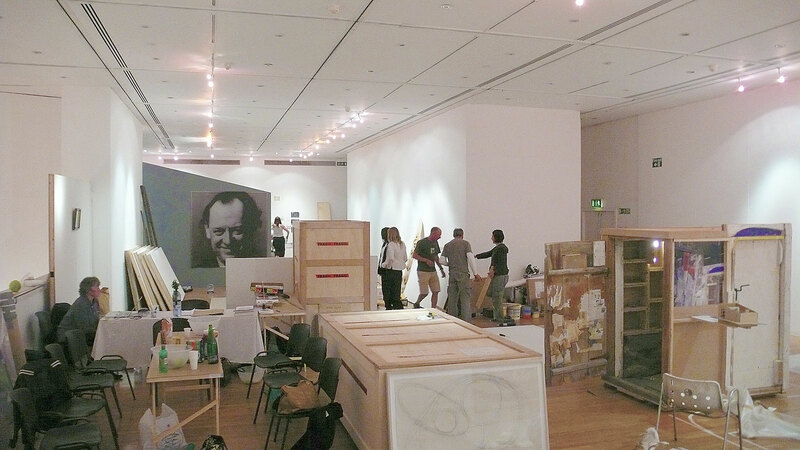 The Kurt Schwitters in England working party went through a wobble or two but was re-established as a panel of advisors that included Tate archivist Adrian Glew, Prof. Nigel Whiteley of Lancaster University, Roger Cardinal, writer on Outside Art, art critic Mel Gooding, Dr. Sarah Wilson of the Courtauld Institute of Art, Rosanna Raymond, Cian Quayle (later of Chester University), Andrew Shepherd, architect, and newly graduated artist Adam James. Patron of the Merz Barn project was Mary Burkitt. The first major project undertaken after acquiring the Merz Barn was the KS07 Autumn School in September. This event for the first time expanded beyond the by now traditional Open Day at Cylinders to include exhibitions at Cylinders and in Ambleside, and an ambitious week-long community radio project, MerzFM. 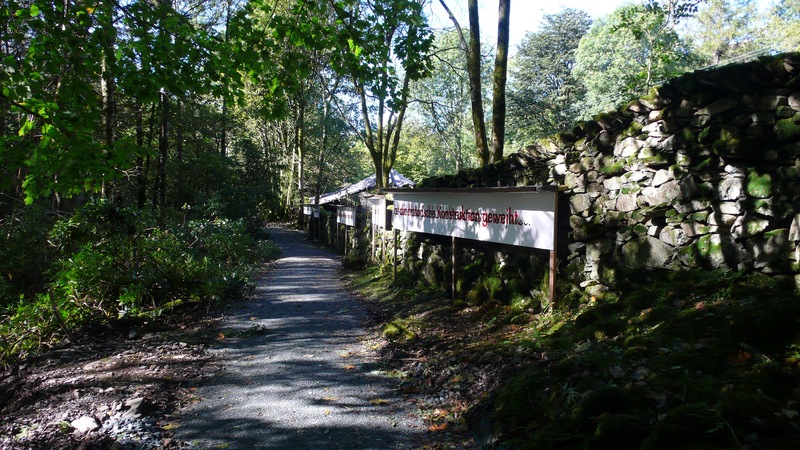 There were two days of seminars, the first in Zeffirelli’s Cinema in Ambleside, ‘MERZ in Ambleside: Schwitters Remembered’, and the second at Cylinders, ‘MERZSCHRIFT: Investigating Schwitters’ writings, performances and poetic works’, with a keynote address by Jerome Rothenberg. Text piece by Marit Muenzberg created for the Merzweg exhibition in 2008. It was during KS07 that the ‘Hanover Willow’ was planted at Cylinders. This was a cutting taken several years earlier from the magnificent weeping willow in the park adjoining the Sprengel Museum in Hanover. It was planted by Jerry Rothenberg’s wife in the centre of the grassy space in front of the Shippon, and despite the odds against it has continued to grow, a ‘most loyal enemy alien’ (as the inmates of the Hutchinson Camp detention centre on the Isle of Man jokingly referred to themselves during their stay. The theme of emigration is everywhere at Cylinders. Indeed, the theme of the KS08 Autumn School was emigration, taking two powerful contemporaries, Kurt Schwitters and Walter Benjamin as the theme. 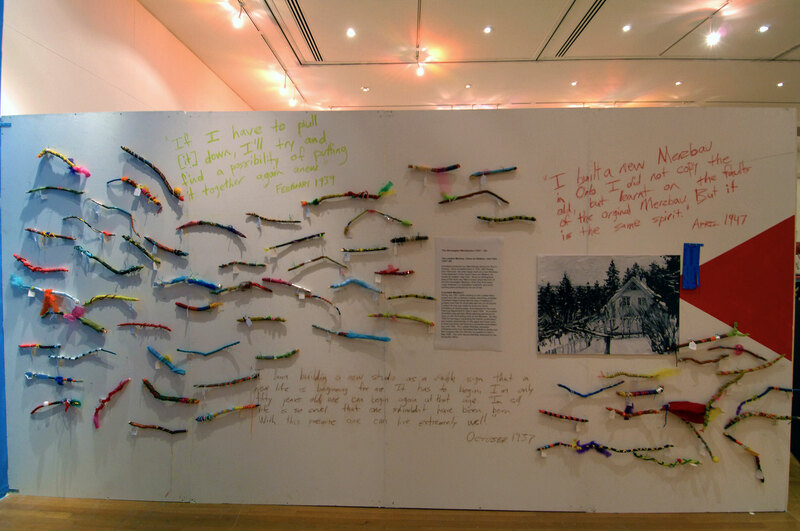 The work illustrated (above) running along the path to the Merz Barn is a text piece by Marit Muenzberg featuring the same quotation from Benjamin in German and Hebrew. Translated it reads: ‘It is more difficult to honour the memory of those without names than to celebrate the famous. It is the duty of historical reconstruction to bring back the memory of the nameless’ (Walter Benjamin). The Annual Kurt Schwitters Memorial lecture was given by Professor Esther Leslie, Birkbeck College University of London, and titled ‘Suitcase Cultures: Walter Benjamin and Kurt Schwitters‘. 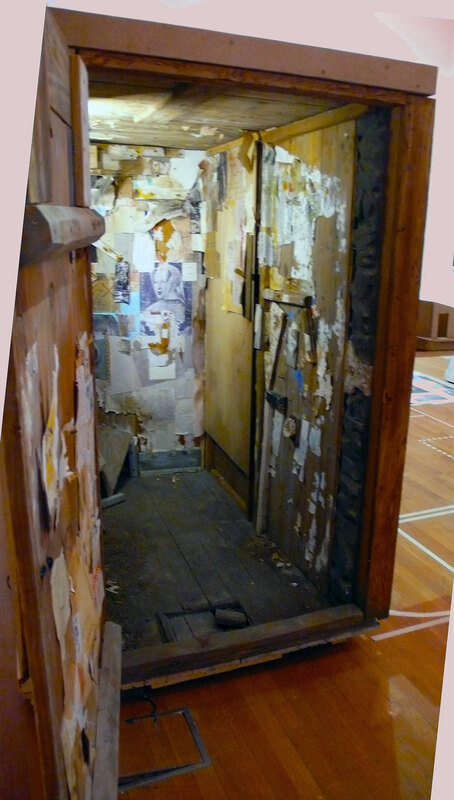 The accompanying exhibition, ‘New Roots’, by Diane Rickerby, was themed on a partnership project with Lithuanian and Slovakian migrant women workers in Maryport. Although the facilities at Cylinders were still minimal electricity had been installed, there was piped water from the stream in the top field, and clearings had been established amidst the trees so that there was space for tents. 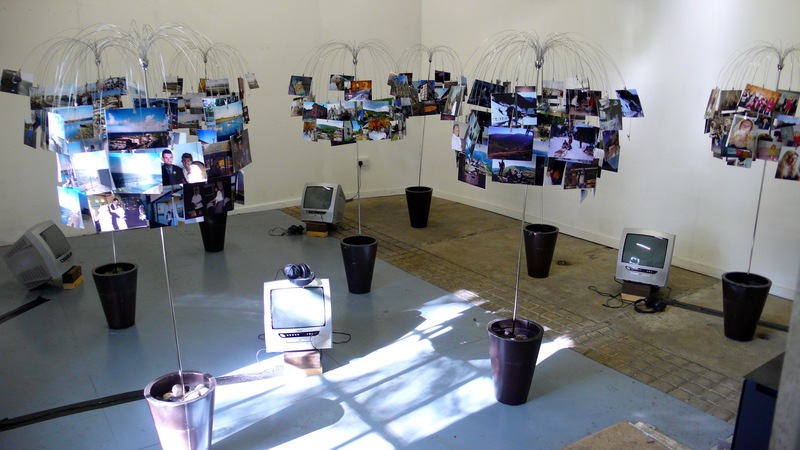 The first residencies for artists and students were organised, with the very first one taking place in May 2008 when a group of 20 students from the Slade College of Art came up, and were lucky enough to experience a prolonged spell of fine weather. Students from the Slade School of Art at Cylinders, May 2008: final assessment. A relationship was established at this time with Langdale Primary School that has lasted to the present, with the children not only carrying out projects at Cylinders but also acting as an independent consultancy team on our educational programmes. The first project they worked on was the Snake Sticks. 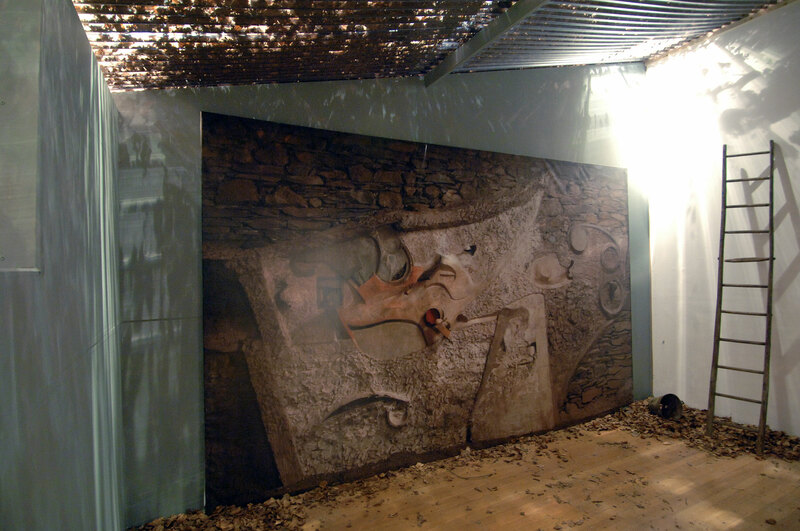 This has proved very popular down the years: Schwitters, who had his superstitious side, originally placed a small horseshoe and a stick painted to resemble a lucky snake over the door into the Merz Barn. 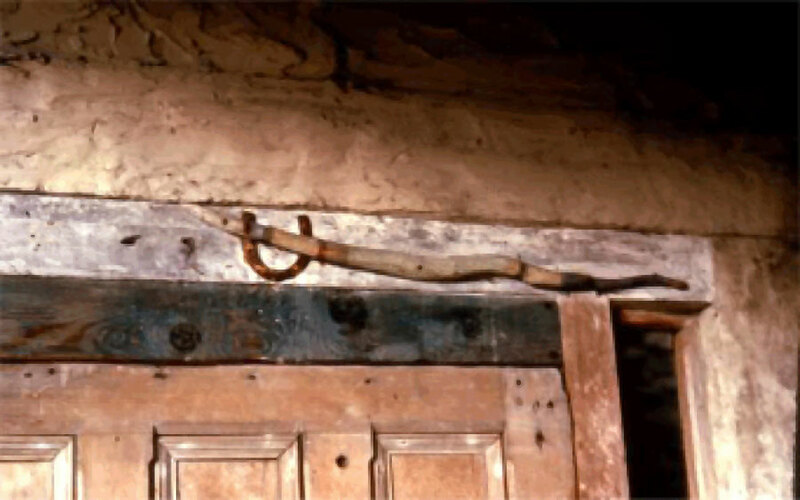 Although the horseshoe is still in place the stick disappeared, believed stolen, at some point long after the artwork had been removed from the Barn. It was suggested to the children that they should perform the magic task of creating a million beautiful snakesticks to replace the one that had gone missing. This they, along with children from other schools, and many of the kids who visit Cylinders and the Merz Barn with their parents, are still doing. Exhibitions of the sticks are held from time to time, and they can be found sticking out from between the stones of the walls, or decorating the buildings. The power is accelerating! 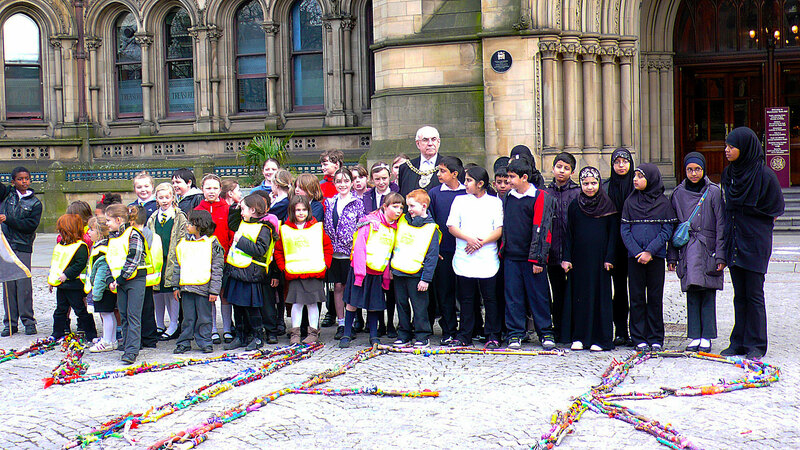 Children from Cheethams Community Primary School presenting the Lord Mayor of Manchester with their Snakesticks, MerzMan project, 2006. 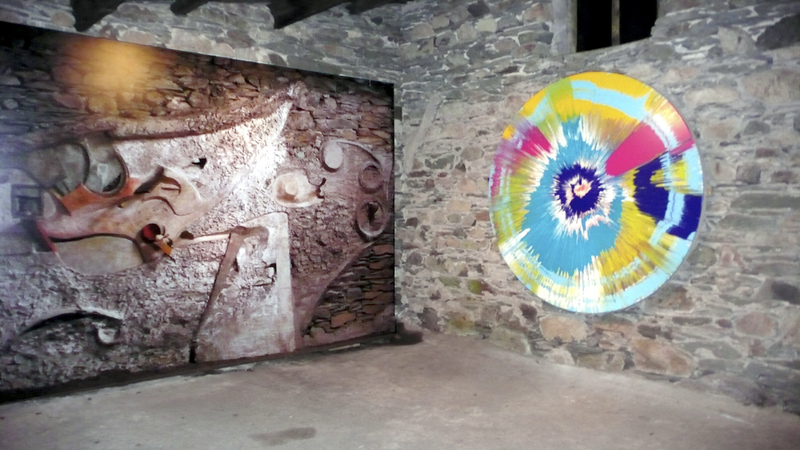 Damien Hirst’s Spin Painting on display in the Merz Barn. 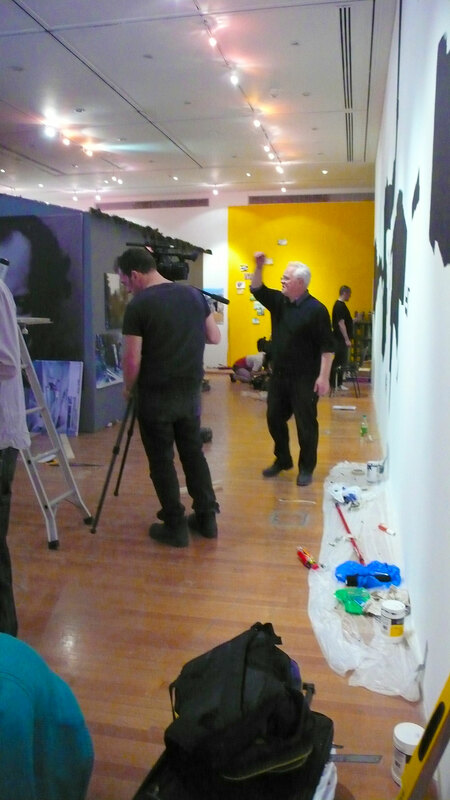 Taking over the Royal College of Art. 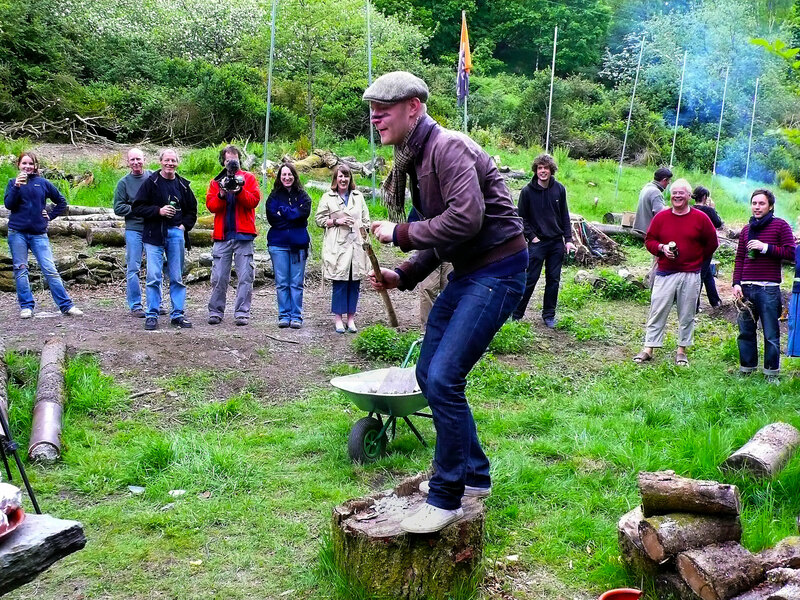 After two fairly quiet years for the Merz Barn project, May 2009 was a key period for the arts development programme. 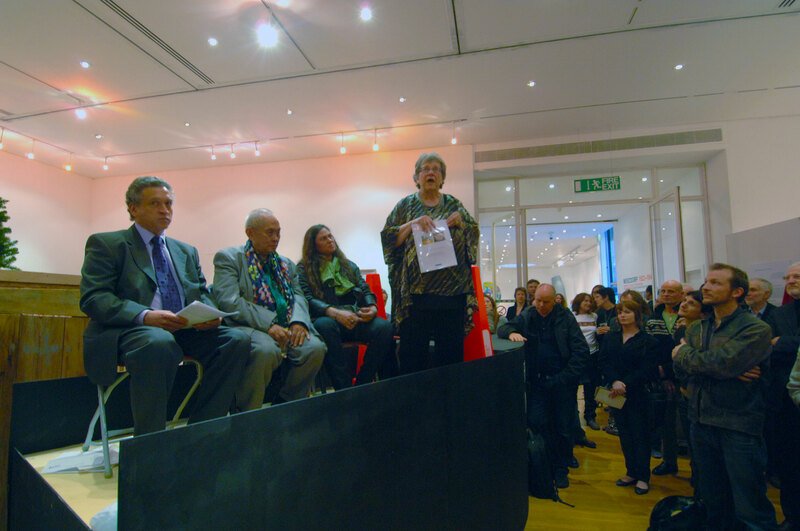 The artists who had donated works to the project so generously had to see their gifts properly honoured. 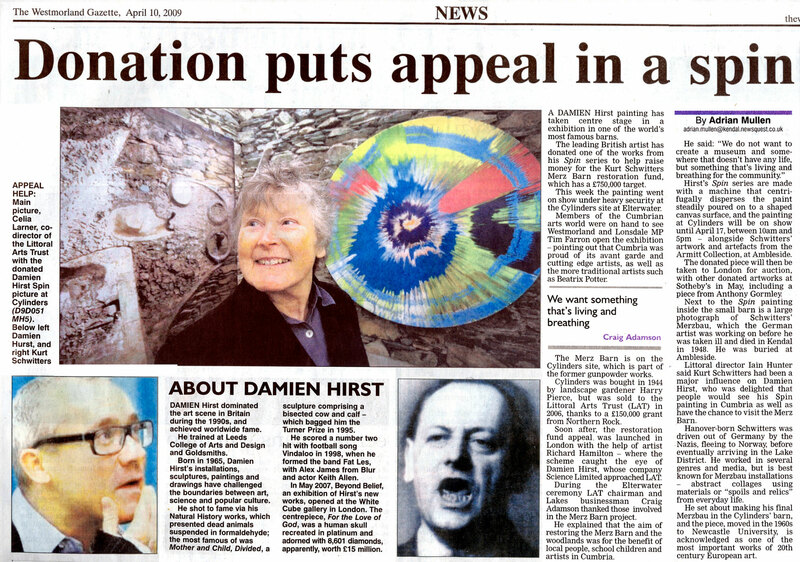 Damien Hirst had given permission for his stunning Spin Painting “Beautiful Lying in the grass, falling into the sky” to be exhibited at Cylinders in the Merz Barn, before it was taken to Sotheby’s for storage and eventual auction. 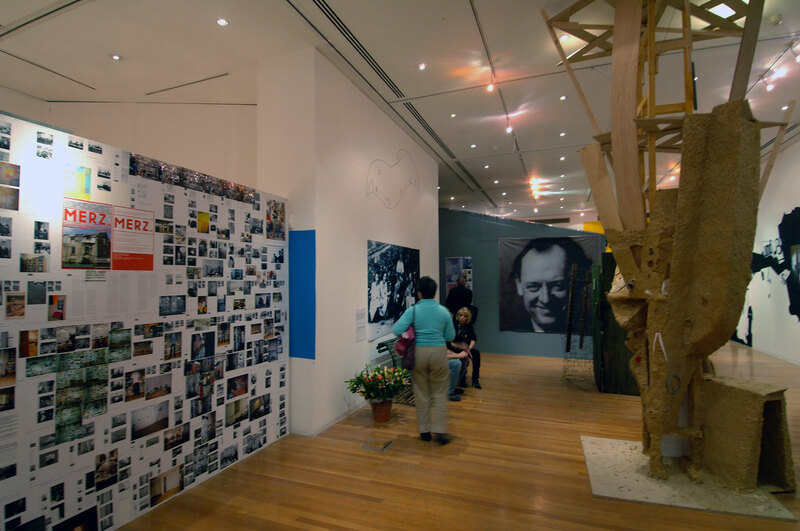 Before Sotheby’s the work was to be exhibited, along with the other donations, at a special Dada inspired exhibition in the Royal College of Art in London, ‘Merzdorf’. Setting up: Dada Trade Fair! 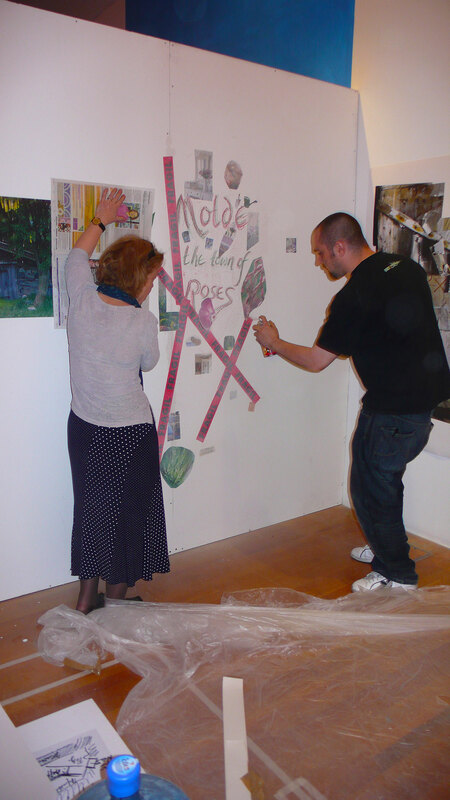 Peter Lewis and Makiko installing their ‘Redux’ display. 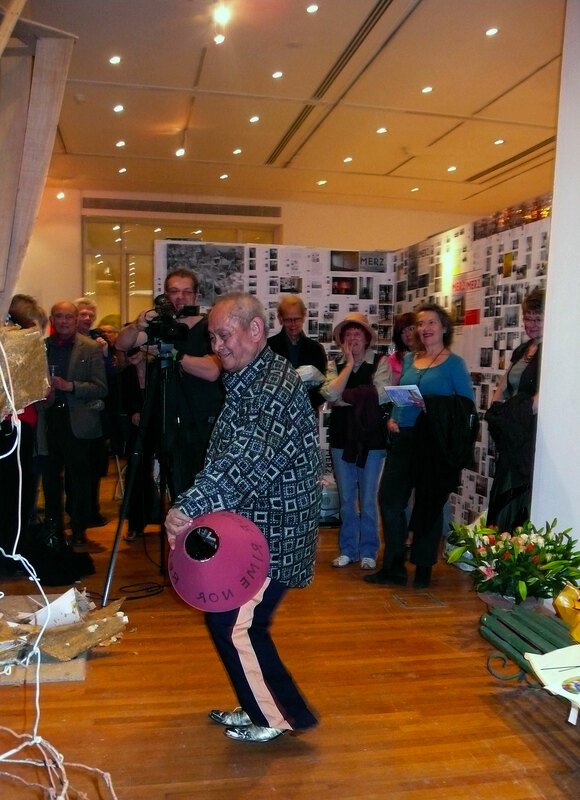 David Medalla performing at the opening of the Merzdorf exhibition. The theme of Merzdorf was the multiplicities embraced by the word ‘Merz’. 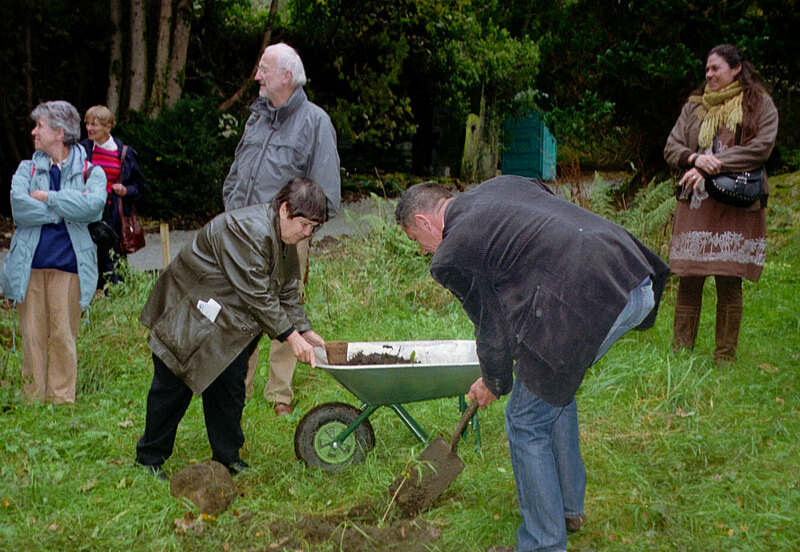 On the one hand there were the works donated by national and international artists in aid of the ‘Save the Merz Barn’ fund; these were allotted their own ‘white’ space. On the other side of the gallery there were installations by a variety of artists selected according to a variety of criteria, some of them Absurdist. Eva Merz, a Feminist Socially Engaged Danish artist, for example, was included largely because of her name. 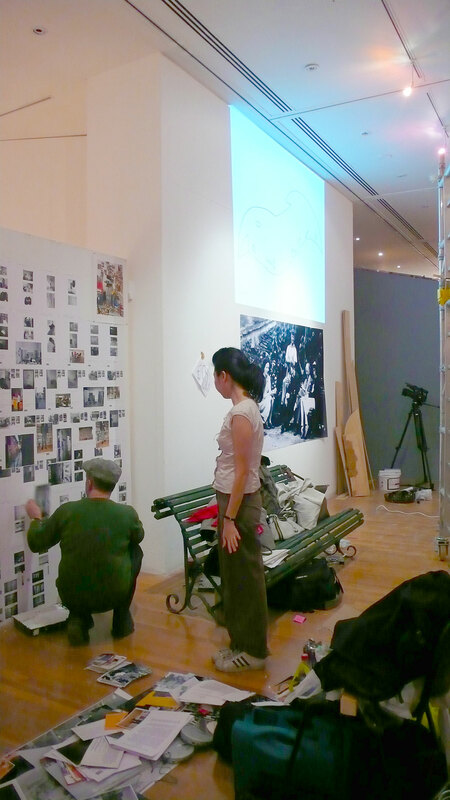 The Redux team, Peter Lewis and his partner Makiko, were selected for their interest in all things Dada. 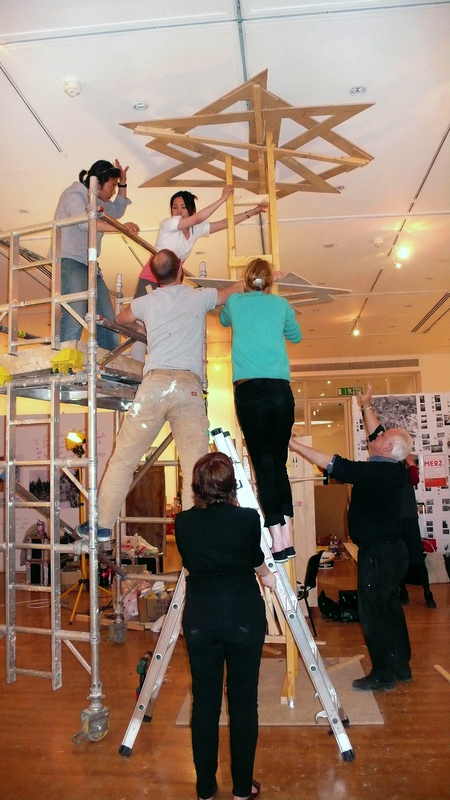 Then there were ‘in progress’ works, such as the Porridge Sculpture in which a trio of students attempted to emulate Schwitters’ reported construction of such a work whilst in the Internment Camp on the Isle of Man. Factum Arte replica of the interior of the Norwegian Schwittershytta. A two thirds life sized mock up of the Merz Barn, with a drift of genuine leafage on the roof, and the actual door from the original barn, plus the bench on which Schwitters once sat in the sun outside the Shippon with his Langdale friends, provided authenticity. Rather better than authentic was the magnificent one third size replica by Factum Arte Madrid of the Schwittershytta in Norway, on the island of Hertøya. 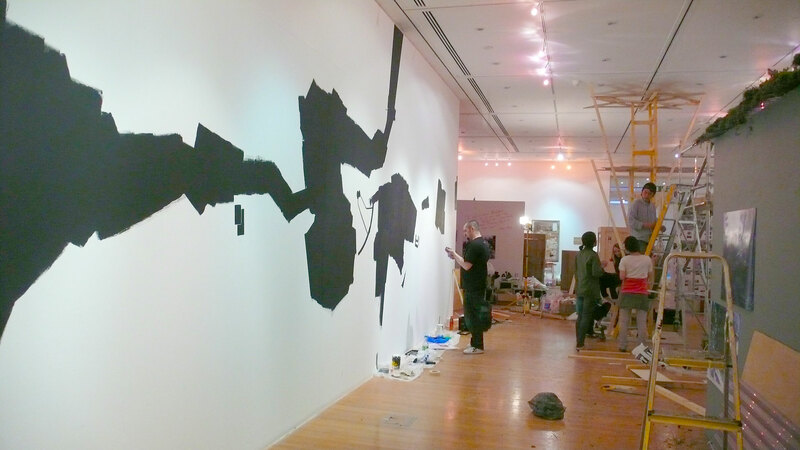 event, by artist David Medalla in particular, and Jaap Blonk’s renditions of the ‘Ursonate’. On day 2 of the event proper there was a serious seminar, followed by an unserious MerzKabaret. The latter featured a number of acts, amongst them a version of Hans Arp’s celebrated Dada performance, with Blonk wearing an outsize suit made of paper. Ellie Dennis sang ‘Alabama’ and ‘Surabaya Johnny’ by Kurt Weill. And so on, and on. 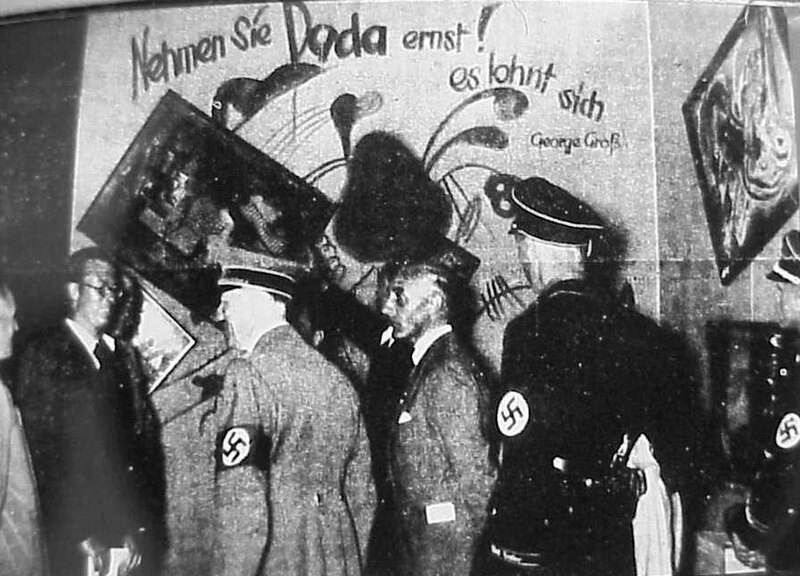 ‘Take Dada Seriously’, newspaper photo of Hitler visiting the 1937 exhibition of so called Degenerate Art in Munich. The Merzdorf auction was conducted by Mr Riding from Sotheby’s, and took place on May 6th. Hirst’s Spin Painting remained unsold, which turned out to be rather a good thing as it later fetched £150,000 at a ‘proper’ Sotheby’s sale of modern paintings. The money raised kept the Merz Barn project going for the following four years. 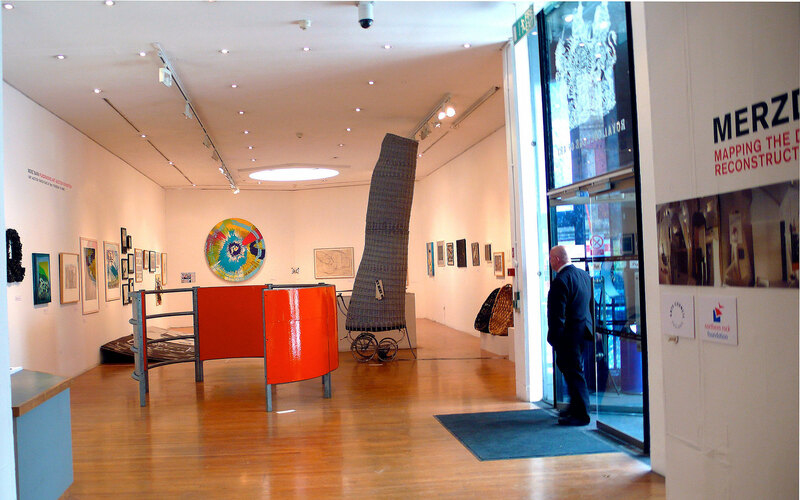 The RCA Auction: donated artworks on display. 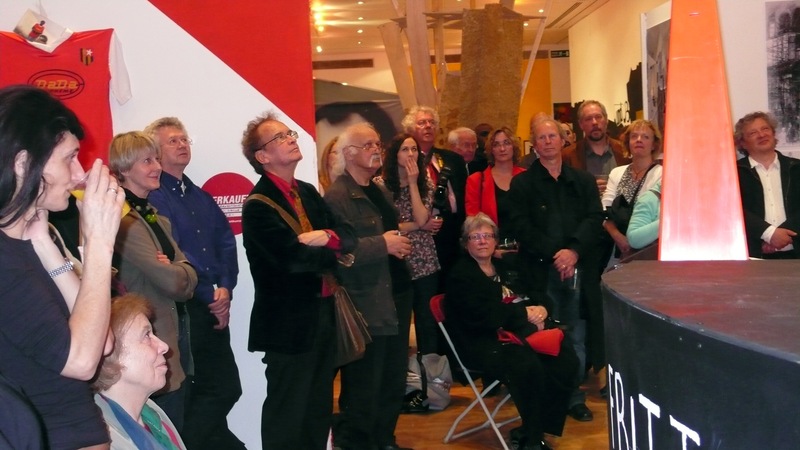 Some more images of the event, photographer Rob Fraser.